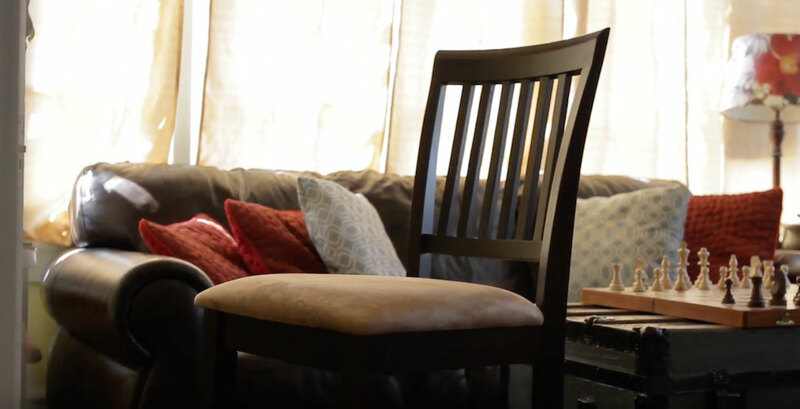 A chair repair solution that actually works. Are you tired of loose wooden joints that wobble, squeak or loosen over time? Looking for a chair repair solution that actually works? Tite Chairs® quickly fixes those wooden joint problems. Just apply a few drops of Tite Chairs® into the loose joint. Tite Chairs® does not swell the wood, but is actually a super powerful adhesive with almost 4000 psi of holding power. Not only is it super strong, Tite Chairs® is also super thin. This means that it can penetrate loose joints in chairs and other furniture without having to take them apart! That means less time for the repair and less mess to clean up. Tite Chairs® is not just for furniture; it works great on loose tool handles, staircase spindles and dovetail joints, as well as metal, rubber, glass and most ceramics. Fix a loose shoe sole? Remove rust and loose paint with sandpaper or wire brush Smooth, glossy and shiny surfaces should be scuffed using sandpaper to increase adhesion. I’m concerned that, if this stuff dries quickly, it will be hard to get it on all 3 loose joints and push them together before the first one dries. There is no need to pull out the loose rungs. The product works best and is designed to penetrate, Put the joints in place as tight as possible and trace around the joint using the applicator tip. The glue will penetrate and tighten the joint within minutes. After using this product to tighten a loose back joint on a wooden dining chair, how soon afterward can someone actually sit in the chair? The chair should be nice and tight within 5-30 minutes. Reapply if still wobbly. Does this listing include the applicator tips? The photo only shows the bottle. Is this item water resistant? Yes the product is water resistant once it cures. Do you need to drill holes into the joint intersection to let the glue run into the joint? There is no drilling of any holes required. You simply apply Tite Chairs® around the joint and let stand for at least 5 minutes. It penetrates the joint on its own. Does this glue dry clear? Yes Tite Chairs® dries clear. How many joints in a chair could 20 g. fix? A 20 g. package will repair between 4- 8 chairs depending on the amount used on each joint. The 5 g. package is designed for a single use and will do 1-2 chairs. Does Tite Chairs® work on other surfaces or just wood? Tite Chairs® works on a plethora of surfaces. 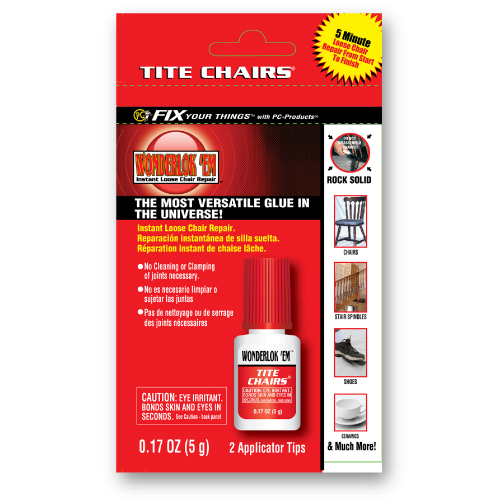 You can use Tite Chairs® anywhere you would use a Super Glue type product. Tite Chairs® has strength FAR exceeding a typical Super Glue and is much more waterproof once dried. Where can I get Tite Chairs®? The product is available in store at: Ace Hardware, True Value Hardware, Do-It Best, Bomgaars, Thiesen Supply, L&M Supply and other Hardware stores. With PC-Products® acquisition, the list will expand rapidly. Tite Chairs can also be purchased at many on-line sites including Amazon, Jet.com, Van Dyke’s restorations etc. There are also a number of Antique Malls that carry the product. Can the tips be cleaned or reused? Hold the bottle in the upright position with the tip on. Squeeze the bottle to expel any product in tip. Wipe outside of tip with dry paper towel to remove any product, and then release the bottle drawing any remaining product in tip back into bottle. Repeat if needed. Remove the tip, wipe off tip with a dry paper towel, snap on small reusable cap. OR Leave the tip on – store bottle upright. If the tip becomes clogged, cut off the end of the tip. This usually works for 2 or 3 applications. Always use in a downward position. Do not attempt to apply upwards. The product is very thin and will run downward and not into the area being repaired. Be sure to wipe up drips immediately with a dry paper towel. It is always best to cover the surrounding area being repaired with plastic or foil to catch any drips or overflow. 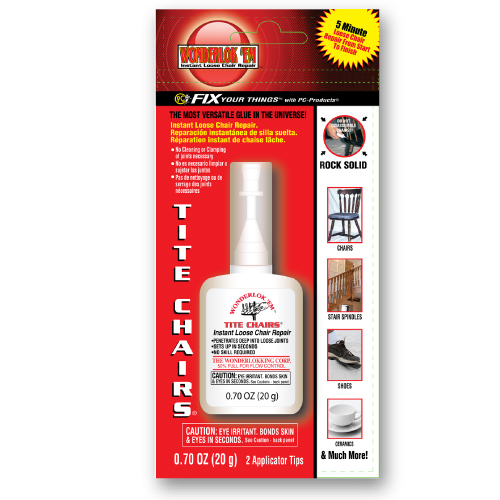 Always make sure the rungs being repaired are tightly in place prior to applying the Tite Chairs®. The thin viscosity allows deep penetration even into seemingly tight areas. Just like a Super Glue type product, Tite Chairs® will bond skin. NEVER touch eyes while using the product. Fingernail polish remover works nicely to remove hardened drips of the product. 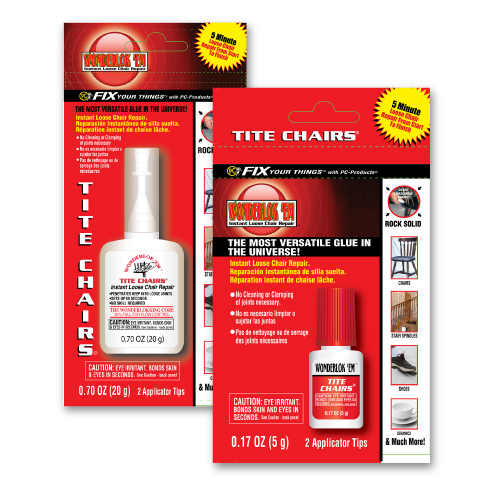 The Tite Chairs® is very thin in viscosity and it does not take much to repair a rung.